Is Immigration Policy Changing The Picture For Student Housing? Anecdotally, most universities reported fewer international applications this year, reputedly based upon international concerns related to the rhetoric of President Trump, Pierce’s Fred Pierce tells GlobeSt.com in part 2 of a two-part story. 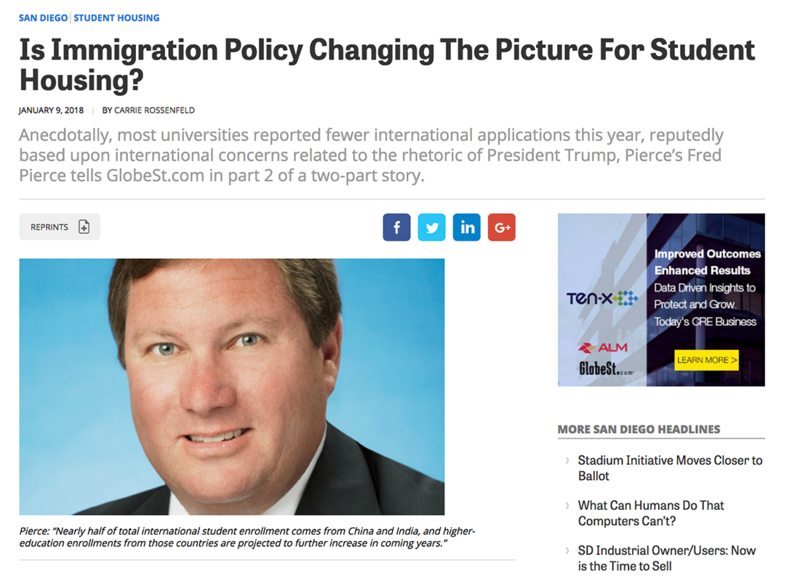 SAN DIEGO—Anecdotally, most universities reported fewer international applications this year, reputedly based upon international concerns related to the rhetoric of President Trump, Pierce Education Properties’ CEO and president Fred Pierce tells GlobeSt.com. Part 1 of this two-part story on student housing focused on changing student income levels and how they are affecting the type of student housing built. In part 2, below, we speak with Pierce about student-enrollment trends over the next few years, the need for privately managed student housing on a national basis and how federal immigration policies might change the face of student housing.